· Snip and a Cut: A well-pruned plant not only looks better and blooms more, but it is healthier too. Centurion Brand Pro-Adjustable Bypass Pruner ($20.99) cuts through any size branch, making Dad a hero. I have been using this pruner everywhere around the outside of my house and so has my husband! It is easy to use and cuts cleanly and quickly without a lot of effort! My bushes are thanking me now! 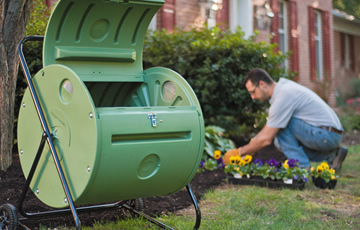 · Compost Tumbler: What better gift for an eco-friendly dad than a compost tumbler? Composting enriches soil, saves water and reduces landfill waste! The best model for small gardens, the Back Porch, ($199) makes compost in as little as 4-6 weeks. · Plants of Steel: This year, forget a tie. Pick up a hard-to-kill Plant of Steel ($ varies) from Costa Farms. Caring for these green kids is easy. Choose from five low-maintenance varieties to fit dad’s style. Available at your local grocery or garden retailer. · Strong, Bigger Plants: Dads are always looking for shortcuts. Enter the new soil additive from Earth Alive - Soil Activator. Simply water into your vegetable garden or flower garden and voila, bigger, strong plants to brag about.